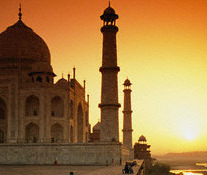 Arrival IGI Airport New Delhi, meet and get assistance by our representative & transfer to hotel for overnight stay. After breakfast drive to Agra. Upon arrival, transfer to your hotel. Check in and freshen up time. Late afternoon proceed to visit the world famous Taj Mahal built by Emperor Shah Jahan in 1630 in memory of his beloved wife "Queen Mumtaz" to enshire her mortal remains. Also visit Agra Fort built by Akbar, reflecting skills of ancient Indian Architects. OvernightinAgra. Morning breakfast at the hotel drive to Jaipur enroute visit Fatehpur Sikhari, the deserted city of Emperor Akbar, which is still in a state of perfection. On arrival transfer to your hotel. Late afternoon enjoy local sightseeing of Jaipur. Visit City Palace, Museum, Hawa Mahal, Ram Nivas Garden and drive past the Pink Rose residential and business areas of Jaipur. Evening transfer to Chokhi Dhani an ethinical village to enjoy the traditional & cultural program followed by Dinner. Overnight at JaipurHotel. Morning breakfast at the hotel. 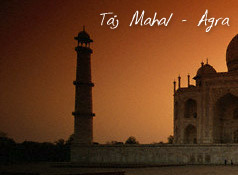 Proceed for full day sightseeing tour of Jaipur including Amber Fort, City Palace, Hawa Mahal & Jantar Mantar. Late evening enjoy shopping as Jaipur is famous for Its brightly embroidered fabrics, carved wooden boxes and screens, silver jewellery and semi-precious stones. Overnight stay at the hotel. After breakfast drive to Ajmer, which is surrounded by the Aravali Hills and located in the heart of Rajasthan. The city has seen the rise and fall of many kingdoms. Upon arrival check into the hotel and later proceed for half day sightseeing tour of Ajmer including Dargah Khwaja Sanib> Tne Museiirn . Rest of the day for leisure. Overnight in Ajmer. After breakfast drive to Udaipur - a majestic architectural marvel towering over the lake on a hill surrounded by crenulated walls, a conglomeration of courtyards, pavilions, terraces, corridors, rooms and hanging gardens. Arrive in Udaipur check into the hotel Rest of the day for leisure. Overnight stay in Udaipur. After breakfast proceed for full day sightseeing & visit City Palace, Saheliyon-ki-Bari, Pratap Memorial Jagdish Temple & Gulab Bagh. Overnight at Udaipur Hotel. After breakfast drive to Jodhpur. Enroute visit beautiful Ranakpur Jain Temples. Arrive Jodhpur, check into your hotel. Rest of the day for leisure. Overnight at Jodhpur Hotel. After breakfast, enjoy full day tour of Jodhpur city. Visit Mehrangarh Fort, Jaswant Thada, Umaid Bhavan Palace, Mandore, Sardar Government Museum. Overnight at Jodhpur Hotel. After breakfast drive to Jaisalmer via Osian temples. Arrive Jaisalmer, check into your hotel. Rest of the day at leisure. Overnight at Jaisalmer Hotel. After breakfast, enjoy full day tour of Jaisalmer city. Visit Jaisalmer Fort, Patwon - ki - Haveli, Tazia Tower, evening drive to sand dunes and enjoy camel ride and camping. Overnight at Jaisalmer Hotel / Swiss Camp. After breakfast drive to Bikaner. Afternoon visit the Bikaner Fort & the city. OvernightatBikaner Hotel. After breakfast proceed to Mandawa. The city is dotted with massive forts and palaces. So our first visit would be to the famous Binsidhar Haveli. The big stupendous mansions are called Havelies here. There are so many Havelies in Mandawa. All of them adorned with beautiful paintings and carvings. The Ladiya Haveli, Gulab Rai Haveli and Nawatia Haveli are other five examples. The important thing is that Every Haveli has its own architecture, unique decoration and story. No two rooms in one Haveli are alike. Every room is unique and different from each other. If one room is decorated with paintings of Lord Krishna and his sacred cow, the other room proudly adorned with a fountain. It would delight you so much that you would like to stay here for ever. Great photographic moments can be enjoyed here. Overnight at Mandawa Hotel. Enjoy breakfast at the hotel. Checkout 8 drive to Delhi. Upon arrival check into your hotel. Rest of the day at leisure. Overnight at Delhi Hotel.